NASA’s Mars rover Curiosity team is working to restore Curiosity’s sample-drilling capability using new techniques. The latest development is a preparatory test on Mars. 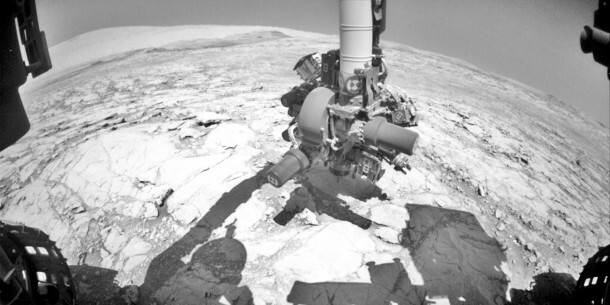 The five-year-old mission is still several months from the soonest possible resumption of drilling into Martian rocks. Managers are enthusiastic about successful Earth-based tests of techniques to work around a mechanical problem that appeared late last year and suspended use of the rover’s drill. Curiosity has used its drill to acquire sample material from Martian rocks 15 times so far, from 2013 to 2016. It collected powdered rock samples that were delivered to laboratory instruments inside the rover. On each of those occasions, two contact posts — the stabilizers on either side of the bit — were placed on the target rock while the bit was in a withdrawn position. Then a motorized feed mechanism within the drill extended the bit forward, and the bit’s rotation and percussion actions penetrated the rock. The drill’s feed mechanism stopped working reliably in December 2016. After exploring possibilities of restoring the feed mechanism’s reliability or using it despite unreliability, the project set a priority to develop an alternative method of drilling without use of the feed mechanism. The promising alternative uses motion of the robotic arm to directly advance the extended bit into a rock. The sensor’s main use until now has been to monitor for a force so excessive of expectations that it would automatically halt all arm motion for the day. The new “feed-extended” drilling uses it to compensate for side loads. This test will help engineers determine how data from the sensor can be used most effectively. Using this method, a near-twin of Curiosity at JPL has collected drilled samples from Earth rocks. The team has also developed methods to deliver drilled samples to the laboratory-instrument inlets on the test rover’s deck without use of the drill’s feed mechanism. Development of this alternative sample-transfer technique is needed because the process used previously depended on having the bit in a withdrawn, rather than extended, position. The rover’s current location is on “Vera Rubin Ridge” on lower Mount Sharp. Curiosity is nearing the top of the 20-story-tall ridge. It has been studying the extent and distribution of the iron-oxide mineral hematite in the rocks that make up the erosion-resistant ridge. During the first year after Curiosity’s landing near Mount Sharp, the mission accomplished a major goal by determining that, billions of years ago, a Martian lake offered conditions that would have been favorable for microbial life. Curiosity has since traversed through a diversity of environments where both water and wind have left their imprint. Vera Rubin Ridge and layers above it that contain clay and sulfate minerals provide tempting opportunities to learn even more about the history and habitability of ancient Mars.